In his Easter message, Pope Francis offered words of hope and encouragement to people across the globe who are living in situations where “evil seems to have the upper hand” because of armed conflicts or terrorism—he mentioned 18 such countries, and in places where fear causes nations to close their doors to migrants and refugees fleeing these conflicts and poverty. Speaking from the central balcony of St. Peter’s Basilica, on a sunny Easter Sunday, to some 100,000 people in the square in front of him and to a vastly greater global audience of more than one billion people, he told them that the source for this hope and courage is to be found in the fact that Jesus has risen from the dead. Francis first thoughts went to the ongoing dramatic situation in the Middle East, which has not experienced peace since the war on Iraq started in March 2003. He sought to encourage the nascent peace process in Syria, “a country torn” by a five-year conflict that has brought “destruction, death, contempt for humanitarian law and the breakdown of civil concord.” He asked the Risen Lord to enable those early peace talks to “bear fruit in peace” in this land of 23 million people where already 250,000 have been killed and 11 million forced to leave their homes. Turning to other areas in the Middle East and the Mediterranean area, he prayed to the Risen Lord too to “overcome hardened hearts” and enable “a fruitful encounter of peoples and cultures,” especially in Iraq, Yemen and Libya where conflicts still rage. As he has done every Easter since becoming pope, Francis also today drew the world’s attention to the land where Jesus was born and rose from the dead, and called anew for “direct and sincere negotiations” between Israelis and Palestinians. He appealed to both sides for “an openness and commitment” to end a conflict that has lasted almost 70 years. The Argentine pope called on the Risen Lord to enable all the people of Venezuela “to work for the common good” and cooperate together end the dramatic social and political tensions in that land, or as he put it “the difficult conditions which they are experiencing.” He also asked him to bless the efforts to bring a definite solution to the conflict in the Ukraine. The world today is experiencing a refugee and migrant crisis of proportions not seen since the Second World War, involving some 50 million people. Francis spoke about this again today, and said the Risen Christ “invites us not to forget those men and women seeking a better future,” this “ever more numerous throng of migrants and refugees, including many children, fleeing from war, hunger, poverty and social injustice.” He drew attention to the fact that “all too often, these brothers and sisters of ours meet along the way with death or, in any event, rejection by those who could offer them welcome and assistance.” His words took on particular significance in Europe, where so many countries are closing their doors and hearts to the plight of these desperate people. Last year Francis wrote an encyclical on the plight of planet earth due to climate change and other problems, and today he again expressed concern at its ongoing exploitation, through greed, which is causing “drought, violent flooding” and “food crises” in many countries. In today’s message, he drew the world’s attention to the fact that Christians are being “persecuted for their faith” in many countries. He encouraged these courageous followers of Jesus never to lose hope because the Lord in whom they believe has “conquered” death and has risen and is with them. Pope Francis concluded his Easter Message by calling on people everywhere, inspired by the Risen Jesus, “to set out anew with greater courage and hope to blaze trails of reconciliation with God and with all our brothers and sisters.” This is, “necessary, especially today,” he said. As he finished speaking, Francis wished everybody “Happy Easter,” and “a good Easter lunch” and asked them to remember him in their prayers. 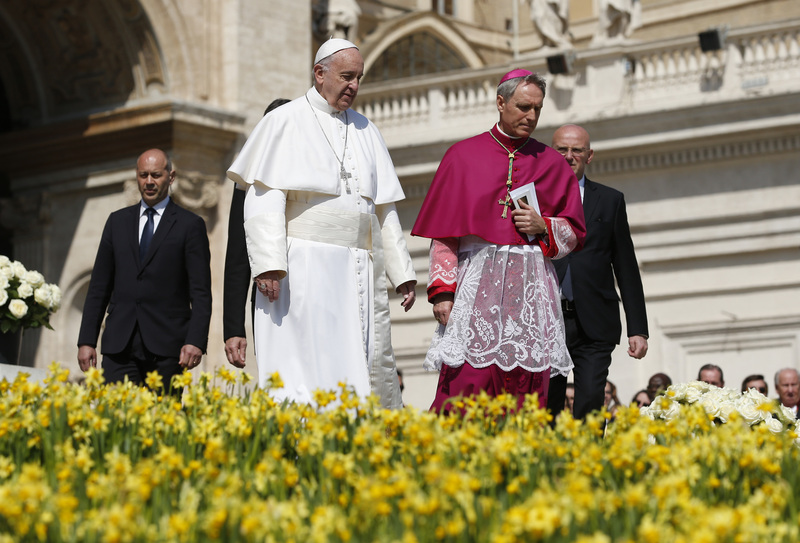 He delivered his Easter Message after celebrating Mass in St. Peter’s Square, in the presence of cardinals, bishops and ambassadors from many countries, and some 100,000 pilgrims from many countries and all continents, who cast aside fears and concerns linked to terrorism to come and pray with him. There was a real festive atmosphere in the square, enhanced by the splendid and colorful flower arrangement around the altar thanks to the generosity of flower-growers from the Netherlands. The Sistine choir enlivened the celebration by its joyous singing, and a military band played at the end, as a tribute to this man of peace. Today’s ceremony ended a very demanding week for this tireless, courageous and joy-filled pope. He showed great energy as he communicated his message of hope and peace to a world that is in great need of both.